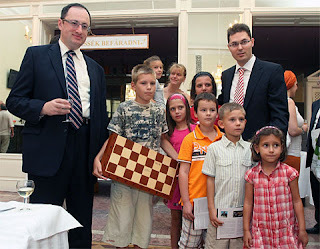 This one's for the kids: Gelfand and Leko. The Blitz Chess Tournament in Miskolc, Hungary is all even at the end of four rounds. Peter Leko beat Boris Gelfand in the fourth round to equal the scores at 2.0-2.0. Gelfand had won the first game while the second and third games were drawn. This Rapid Chess event is being organized at the National Theater from August 25–29, 2010. The games are being played at a rate of 25 minutes for all moves plus an increment of ten seconds per moves. Colours change at half-time. In case of a 4-4 draw blitz games decide the winner. The arbiter of the match is WGM Zsuzsa Veroci, head of Communication of the Hungarian Chess Federation. You can check the official website here. Here is the nice fourth game in which Leko drew level with the Israeli grandmaster. You can run the moves in our pgnplayer or watch in flash below.